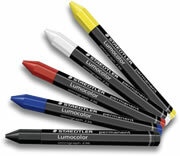 Lumocolor permanent omnigraph is an essential tool for industry and trade. The waterproof, non corrosive pigments will mark almost any surface including glass, leather, stone, metal and wood. The colour intensive core will leave an opaque mark even on dark and transparent surfaces. 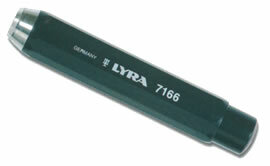 A robust crayon with a hexagonal shape for easy grip, the omnigraph comes in 5 permanent, lightfast colours. Permanently marks most surfaces, including wood (wet or dry), glass, leather, textiles, stone, metal and plastic.